Afew weeks ago, Electronic Arts released Battlefield 1942, the successor to developer Digital Illusions' ambitious but deeply flawed game Codename: Eagle. Against the odds, Battlefield turned out to be a great popular and critical success, topping sales charts and winning GameSpot's PC Game of the Month for September 2002. Maybe it's a season of miracles, because Xicat has published Mirage Media's Sniper: Path of Vengeance, a first-person shooter that--improbably--is actually more awful than the developer's last game, the thoroughly wretched Mortyr. Sniper's stat system has no discernible effect on anything. Sniper has a lot of big-ticket problems such as bugs, poorly implemented gameplay elements, ridiculous and ridiculously profane dialogue, and terrible enemy AI. But let's start with a small detail that captures Sniper's pervasive atmosphere of clumsy amateurism. A few of the game's early levels take place during a prison riot. As you make your way through the prison, you'll notice that some of the corridor walls are conspicuously decorated with a large photo of what looks to be a member of the development team and his cute little toddler. Unlike in some games where pictures of the developers are hidden in images that are appropriate to the environment, it appears here as if somebody scanned a family photo, didn't alter it in any way, and then inexplicably made it a recurring theme of the bleak prison's visual design. This would be a great idea if Sniper had been developed as a foul-mouthed interactive Mother's Day card, but in a full-priced game targeted at consumers who aren't directly related to the staff of Mirage Media, it's just ridiculous. The game's title pretty much sums up the plot: You're a sniper and you're out for revenge. This revenge is motivated by...something or other. 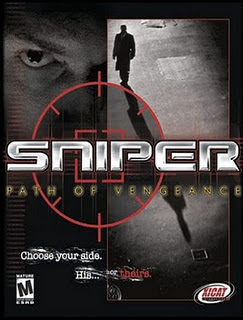 But despite the game's title, the path to your vengeance doesn't include much in the way of actual sniping. You do get a sniper rifle, but for the most part you'll be using a traditional arsenal of machine guns, pistols, and grenades to blast your way through the army of henchmen standing between the entrance and exit of each level. In what might be an effort to make the game's title a little more relevant, enemies scream "Sniper!" even if you're firing at them with a shotgun from three feet away. Graphically, architecturally, and thematically, Sniper's level design is merciless in its unrelenting blandness. From sewers to generic office buildings to barren streets, there's nothing in the environments that hasn't been done before and better. The most unique feature of Sniper's levels is that, for some reason, the game returns to the desktop for a few jarring seconds during each level transition. These transitions also occur at odd moments. You may be fighting a couple of enemies positioned at the end of a hall, take a step toward them, and unexpectedly trigger the next level, which magically transports you away from your opponents. Powered by LithTech's Jupiter engine, Sniper's visuals are even less impressive when compared to the competition than were Mortyr's two years ago. In some ways, Sniper's visuals are specifically worse than Mortyr's. For instance, Sniper has none of Mortyr's occasionally effective reflective surfaces. Mortyr's enemy AI primarily caused the game's characters to run right at you, wobble back and forth while firing, or ignore you altogether while jogging in tight circles. For Sniper, the programmers have retained the running-right-at-you and wobbling-back-and-forth behaviors but have fixed the jogging-in-circles problem. In its place, they've added the brand-new ability for enemies to stand around doing nothing, as well as a new bug that lets enemies walk right through closed doors. This door-related ghostliness combined with the way character models appear to move much, much faster than their legs are animating makes your opponents seem disconnected from the gameworld. And while doors generally present no obstacle for everyone else in the shadowy, sniperless world of Sniper, they're like Venus flytraps for you. Often, opening a door will cause you to become embedded in it, at which point you'll have to close the door and then reopen it to get unstuck. A rare shot of some actual sniping. Yet in spite of all its problems, Sniper is still a pretty good game. No, that's just a joke to lighten the mood a bit. Now, here are some other technical problems: About halfway through the game, firing the shotgun causes the screen to go black for a while. So shotgun fans who don't mind terrible games might still want to avoid Sniper. Sometimes when the game makes its brief, between-level detour back to the desktop, it just stays there without ever managing to load the next level. The sound cuts out if you fire a machine gun for too long. On the other hand, the game's frequently grating and bizarrely inappropriate soundtrack never shuts up. It even plays full blast during dialogue scenes, which at least saves you from having to hear the idiotic script. No multiplayer mode is included in Sniper. Just in case Mirage Media decides to sneak one into a future patch, here's a preemptive review: It'll probably be bad. Sniper is derivative, homely, tedious, and buggy. It also has a useless character stat and leveling system, so RPG enthusiasts can hate it too. In all fairness, the developers do deserve credit for one good design choice: Sniper's only about six hours long.